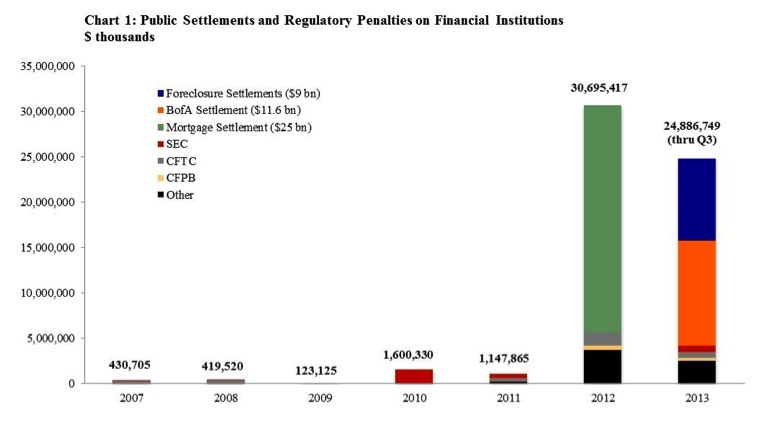 The Committee on Capital Markets Regulation today released data on the total public financial penalties imposed on financial institutions in the U.S. through the third quarter of 2013. Public financial penalties include public class action settlements that arise from class action lawsuits brought by the government (e.g., state attorneys general) and regulatory penalties that follow enforcement actions by regulatory agencies including the SEC, CFTC and others. Through the third quarter, total public financial penalties have reached approximately $24.9 billion, with the third quarter adding $2.3 billion of penalties to the $21.8 billion and $755 million imposed in the first quarter and second quarter, respectively. The third quarter total is larger than the annual amount of financial penalties imposed in any year prior to 2012. The data show that 2013 has continued a trend of historically unprecedented penalties imposed on financial institutions in the United States. Founded in 2006, the Committee on Capital Markets Regulation is dedicated to enhancing the competitiveness of U.S. capital markets and ensuring the stability of the U.S. financial system. Our membership includes thirty-two leaders drawn from the finance, investment, business, law, accounting, and academic communities. The Committee is chaired jointly by R. Glenn Hubbard (Dean, Columbia Business School) and John L. Thornton (Chairman, The Brookings Institution) and directed by Hal S. Scott (Nomura Professor and Director of the Program on International Financial Systems, Harvard Law School). The Committee is an independent and nonpartisan 501(c)(3) research organization, financed by contributions from individuals, foundations, and corporations.